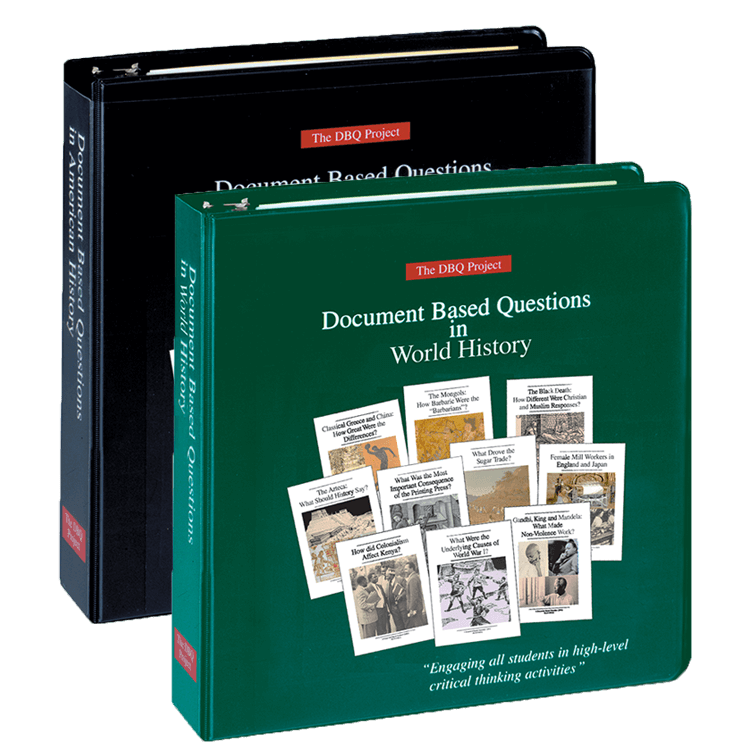 Our DBQ units provide students with the opportunity to engage in the same historical thinking and writing students use in Mini-Qs. The main difference is that with DBQs (often referred to as “Mother-Qs”), students wrestle with more documentary evidence. Each unit is written twice to differentiate between the longer version (14-26 documents) and the shorter version (8-12 documents). Teachers choose which version to use based on time and student reading level. When students construct their DBQ essays, they often use several documents per paragraph to prove each part of their thesis. 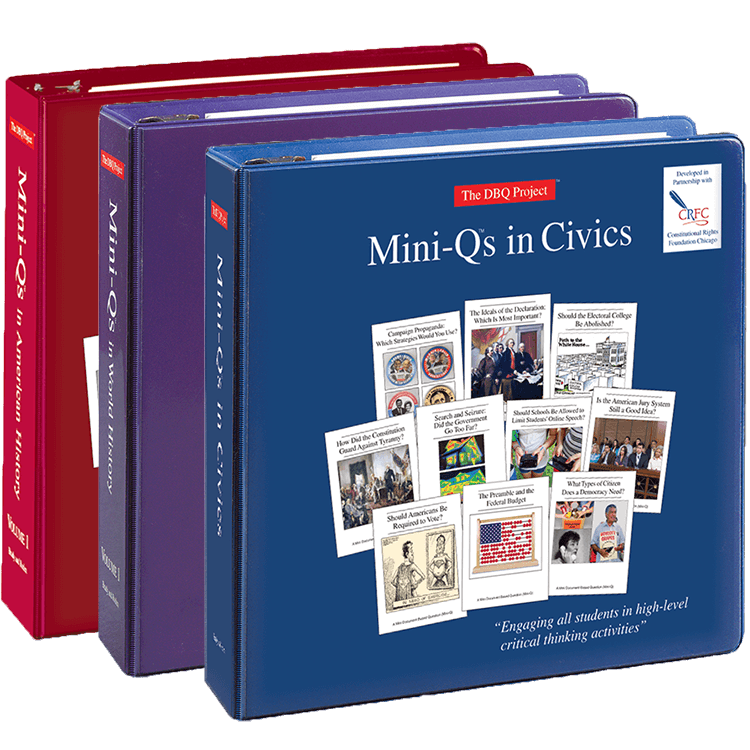 Mini-Q lessons are shorter (3-7 documents) but they also help students understand the process of close analysis, interrogation of documents, and argument writing. Each Mini-Q is written twice to differentiate between the highly scaffolded “enhanced version” and the less scaffolded “clean version.” This means Mini-Qs work for students of all skill levels. To help teachers demonstrate elements of proficient writing, each Mini-Q lesson comes with three norming essays: non-proficient, proficient, and higher proficiency. Students and teachers alike may analyze these sample essays to evaluate writing, to learn protocols for using and citing evidence, and to address questions of style. In short, Mini-Qs are shorter, more scaffolded DBQs. Every lesson separated by its own tab and formatted ready-to-reproduce for students. All questions encourage interpretation, have more than one correct answer, and are arguable. Each lesson is scaffolded for students at different levels to provide teachers the flexibility to support students, whatever their ability. The pedagogy stays the same whether teaching a longer DBQ or a Mini-Q, thus creating a clear vertically-aligned progression. Students use documents just like historians to answer questions. Documents are central, not supplementary. Creates interest, promotes discussion, and builds students’ confidence as they work in pairs and small groups as well as the whole class. Levels the playing field in classrooms with students by building context. Provides all students with enough background to understand the documents. Different graphic organizers help students of various ability levels analyze and record details about each document. We help students develop analytical categories by talking about buckets. Friendly terminology helps students embrace rigorous work. We use student-friendly graphic organizers and to help students understand how to write an argument-based thesis. Teachers use the DBQ Project outline or the more structured guided outlines to support students of different ability levels. Every document contains content-rich suggestions to help teachers engage students in analyzing documents. Additional historical background about the documents helps build teachers’ confidence and knowledge. All visual documents are colorized for use with document cameras. A wealth of resources to help students analyze documents and write evidence- based essays, conveniently located in each binder. Students work with 8-18 documents and wrestle with some longer documents than those provided in the Mini-Qs. Every unit comes in a long version and a short version. The short version has 8-12 documents while long version has 14-18. In the DBQs, the hook is in the “Teacher Toolkit” instead of being embedded in the lesson as it is in the Mini-Qs. With more documents, students wrestle with more complexity. Students group 2-5 documents in each category. Students usually work with 4-6 documents. This provides practice reading and interpreting without overwhelming students. Units come in 2 versions. The enhanced version is highly scaffolded. The clean version includes the same documents, but no support. Document analysis questions located directly below each document in the EV version. In the Mini-Qs, the Hook Exercise is embedded in the materials and appears as “Step One” in every Mini-Q lesson. Since Mini-Qs have fewer documents, each bucket might contain evidence from only one or two documents.